How Me Parent Good – …and you can too! How Me Parent Good – And You Can Too! How Me Parent Good! is an all-new comedy web series that brings you the 110% right way to do mothering. How Me Parent Good: And You Can Too! is a six-episode comedy web series about the perfect way to do parenthood! Created by award-winning comedian Jenny Wynter, the show is sponsored by Moreton Bay Regional Council and is shot and edited by Touchwood Productions. Its bite-sized episodes cover aspects of parenting including cooking with kids, discipline, organisation and other elements of the 110% right way to be a mother. How Me Parent Good: And You Can Too! will launch on Mother’s Day weekend 2018, with a Funny Mummies Comedy Gala at Sit Down Comedy Club, Brisbane. Tix are available here! “(I)…am not exaggerating when I say that she possesses a rare quality – a combination of stage presence, wit, intelligence and honesty – that I don’t come across too often.” Michael Pollock, musical director of Second City LA, credits include The Drew Carey Show, The Tonight Show. Jenny is a comedian and cabaret performer with a known for her spontaneous, energetic and interactive style of comedy. Warm, friendly and engaging, she credits much of her onstage style to a 2-year stint in North America, where she toured her stand-up act throughout Canada with Yuk Yuk’s and performed as a mainstage cast member with the world-renowned improv company Loose Moose Theatre . She has also trained with Second City, Gary Austin (founder of The Groundlings in LA) and completed a residency at the Banff Centre for the Arts, Canada. She has performed stand-up, improv and her one-woman performances at many comedy venues and festivals around the world including: Carnival Cruiselines / Woodford Folk Festival / Melbourne International Comedy Festival / Adelaide Fringe Festival / Brisbane Comedy Festival and more. Jenny’s official website is here. Touchwood Studios are located on 5 tree-studded acres in Bellmere (in the Caboolture Shire) 50 minutes north of Brisbane, Australia. With on site accommodation, the studio is perfectly conducive to the creative process, whilst only being seven minutes drive from all the necessary modern conveniences. 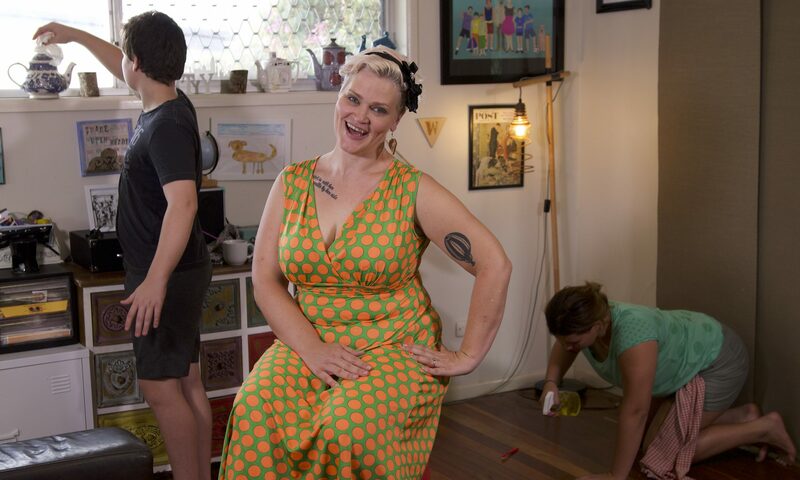 Brisbane comedienne, mother and step-parent of six children, Jenny Wynter, is fighting back against a sea of parenting advice with a new web series poking fun at the ‘how to be a perfect parent’ movement. “From the moment I fell pregnant, I was struck by all the books, blogs, articles, podcasts and vodcasts, selling the message ‘this is how you can be an amazing parent,’ ” said Jenny. “We’re constantly seeing polished, carefully-lit Instagram posts showing ridiculously attractive people doting on their perfectly behaved offspring. You either have to despair at never measuring up, or laugh at the absurdity. “This web series was born from trying to do the latter. After winning the ABC Pitch Perfect Award in 2016 at the Melbourne Web Festival, and a Writers’ Residency at Marseille Web Fest, Jenny decided to make a parenting themed web series. “Marseille Web Fest opened my eyes to a whole new world of bringing your ideas to audiences,” said Jenny. ‘How Me Parent Good: And You Can Too!’, a six-episode series taking a humorous look at parenting was born. “It’s comic relief from the relentlessness of parenthood and a chance to laugh at the absurdity of taking it all too seriously,” said Jenny. The web series can be found at www.howmeparentgood.com or facebook.com/howmeparentgood please use hashtag #hmpg.